Hand picked market leading advisors and investments. Get access to funds that have delivered 44% average per year for 10 years. That's crazy wealth creation. Use the same advisors as the very rich. Our members start with investing as little as ₹15,000 and go up to crores to create wealth with the best advisors that work with the richest 1% of India. Is your bank RM fooling you? They are if you they aren't telling you how you could earn as high as 13% on your short term savings. Cube finds you these hidden nuggets in the market so you make a lot more from your savings. We never sell you a product that isn't right for you - even though we may earn more commissions on it. Leaving money in a bank account or a regular FD means you are losing out to inflation. Check out our inflation-beating products that earn up to 28% short term. Want to Speak to one of our members directly? We research and test before hand-picking the top performing advisors and investments. Earn 13% on short term investments. Earn 44% on long term investments. 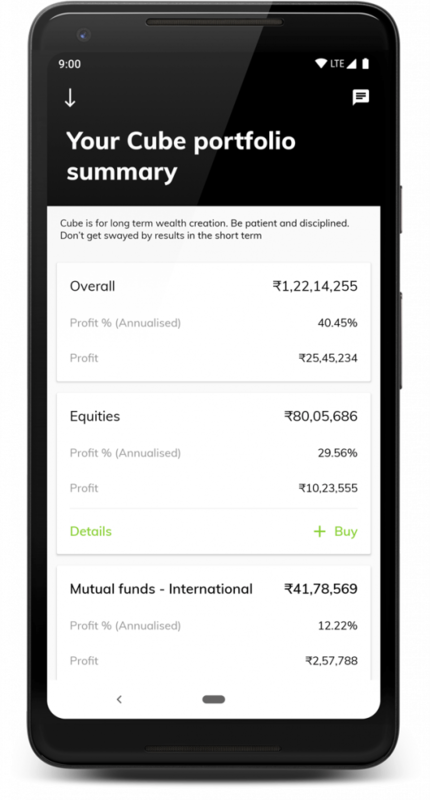 One app to buy, sell and track your portfolio simply in a few taps. Automated investing and SuperSIPs for the ultimate flexibility. Every investment tested with our own money to validate results. Personal service whenever you need to chat on your own private WhatsApp group app or on a call. Register your details and we’ll connect you to a Member via a private WhatsApp group. 1. You’ll be added to a private WhatsApp chat with a Cube Member. 2. Ask them anything you like about Cube Wealth; their experience, how they use Cube Wealth to achieve their investing goals and if they recommend us. 3. Ask us for support or assistance at any time. We promise your details are safe and will only be used to connect you with one of our members to help you decide if Cube Wealth is for you.